Sheep Meadow is the best example in today’s Park of the pastoral vision that Olmsted and Vaux intended for Central Park’s meadows. Their design called for peaceful expanses of green that inspired calm and refreshing thoughts just by looking at them, not necessarily walking upon them. The fifteen-acre meadow holds true to this intention today as Central Park’s largest lawn without ballfields and as a designated quiet zone. No organized sports or gatherings are allowed on Sheep Meadow to preserve the space for quiet picnicking and relaxation. Originally a rocky and swampy terrain, Sheep Meadow was the most expensive landscape in the Park to construct. Its transformation to a pastoral meadow required the blasting of rock outcrops and the installation of four feet of soil. 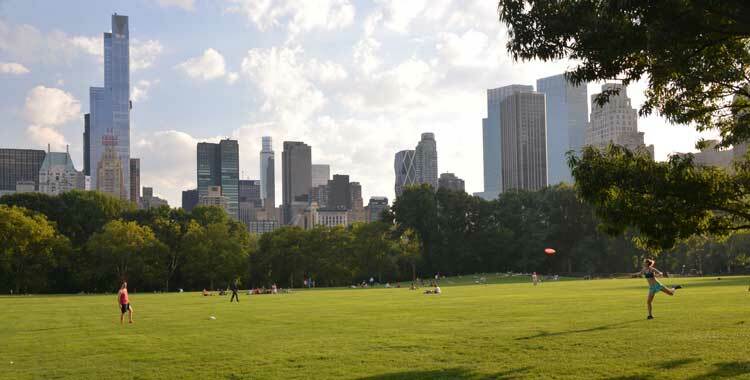 The landscape was first known as “the Green” or “the Commons,” but became known as “Sheep Meadow” in the early twentieth century due to the ever-present flock of pedigree sheep that grazed the meadow. For nearly fifty years, the sheep spent their days on the meadow and their evenings in the nearby Sheepfold, which is now the landmark Tavern on the Green restaurant. In the 1960s, Sheep Meadow became the iconic gathering spot for New York’s counterculture, including anti-War protests, peace rallies, love-ins, be-ins, draft card burnings, Earth Day celebrations, and popular concerts. These events, and the lack of management and proper maintenance, led to severe damage and erosion on the lawn. By the late 1970s, it was a virtual dustbowl. The restoration of Sheep Meadow was one of the first projects undertaken by the Central Park Conservancy in 1980. The newly lush and well-managed lawn was the first green space that many New Yorkers had ever seen in Central Park. Public excitement over the newly opened lawn inspired and outpouring of support for the nascent Conservancy that empowered its first decade of success. Please note: Each winter, Sheep Meadow closes for the season. This allows our turf crew to provide much-needed care for the landscape, ensuring that it will be ready for the influx of visitors come spring. For specific information about when Sheep Meadow will re-open in the spring, please visit the Alerts and Closures page or follow us on Twitter. Sheep Meadow opens daily at 11 AM, conditions permitting. West Side from 66th to 69th Streets.